SWAIN, LYNDON (1 Dee, 1812 26 March 1893), printer, newpaperman, and architect, was the oldest of eleven children. His father Moses Swaim (31 Dec. 1788—25 April 1870) married Adah Swindell (17 April 1791 2 May 1866) of Hyde County on 13 Feb 1812. The family’s farm was on Deep River, in Randolph County’s Timber Ridge community. The nearby village at New Salem was incorporated by legislative act in 1816, and Moses Swaim had been appointed one of the five town commissioners. The same year the elder Swaim had helped to found the North Carolina Manumission Society, and was elected its first President. 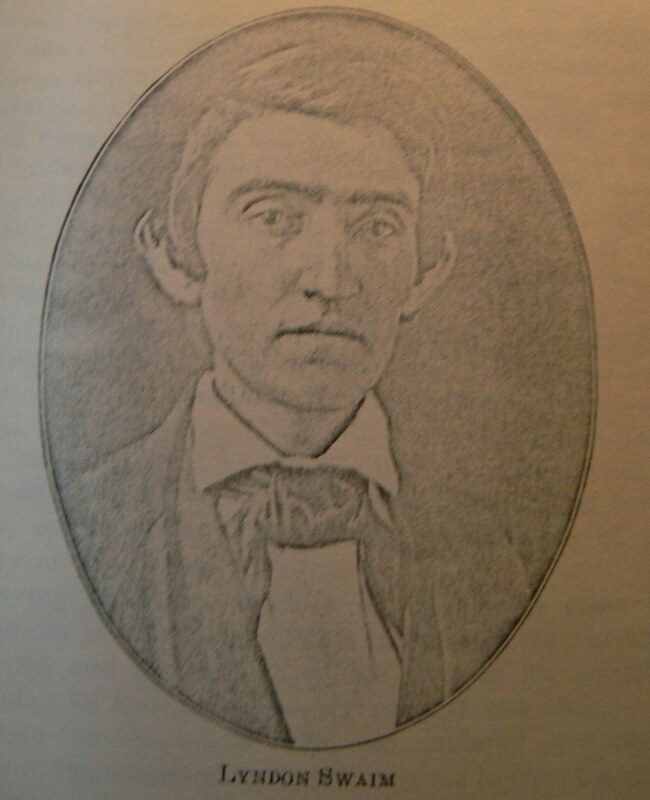 Whether Moses practiced law in addition to farming is unknown, although he was elected Clerk of the Superior Court in Randolph County from 1837 to 1840. In the 1850s Swaim emigrated to Indiana, where he settled on the St. Joseph River, north of South Bend. His death occured during a subsequent visit to North Carolina. Swain devoted the next fifteen years to the Patriot, selling out to Sherwood in 1854 only to devote full time to his official duties as clerk of the county court. He held that office continuously from his initial election in 1853 until it was abolished by the new state constitution of 1868. He additionally served as one of the commissioners of Greensboro in the years l846, 1850-1852, and 1859-1862, and was appointed one of the town commissioners under the provisional government of Governor Holden. Swaim’s final public service occured in 1876-77, when he served as a Guilford County representative to the State Legislature. Swaim temporarily took over the editorial helm of the Patriot once again in 1869, counselling moderation and reconciliation in the race of Reconstruction turmoil. At the same time, he began the study of architecture and subsequently left the newspaper to begin professional practice. Swaim was successful in his new career, becoming known as the town’s leading architect of the 1870’s and 1860’s. Although the facts of this stage of his life are as yet unclear, he is said to have designed residences as well as commercial buildings in Greensboro and surrounding communities. On 3 Jan. 1842 Lyndon Swaim married Abiah Shirley Swaim, widow of his former employer William Swaim. The only child born to this marriage died in infancy. Swaim’s step-daughter, Mary Jane Virginia, became the mother of William Sidney Porter (O. Henry). Abiah Swain died in January, 1858; on 25 Oct 1859 Swaim married Isabella Logan (d. 9 Feb. 1900), daughter of General John N. Logan of Greensboro. Four children, Isabell, Mary, Lyndon and Logan, were born to them; none married. In addition to his other activities, Lyndon Swain was one of the ruling elders of the First Presbyterian Church in Greensboro from 1872 until his death at the age of eighty, following several years of declining health. SEE: Ethel Stephens Arnett, Greensboro, North Carolina: The County Seat of Guilford (1955); Bettie O. Caldwell, ed., Founders and Builders of Greensboro, 1808-1908 (1925 [Portrait]); Deeds (Randolph County Courthouse, Asheboro, N.C); Swain family genealogical records (possession of Mrs. Francine Holt Swain, Liberty, N.C.). “Around 1869, as postwar construction picked up, he made a serious study of architecture, and became Greensboro’s leading architect during the 1870s and 1880s. Although many men in this period moved from being artisans or contractors to taking on the title of architect, Swaim was unusual in entering the field from a background of journalism. In 1880, the 67-year-old Swaim identified his occupation to the census taker as “Architect.” William T. Comstock’s Architects’ Dictionary (an erratically updated publication) listed “L. Swain” (who died in 1893) along with Epps and Hackett (see Orlo Epps) as Greensboro’s only architects in 1894 and 1896. You are currently browsing the Notes on the History of Randolph County, NC blog archives for December, 2011.